New features and usability updates guide photographers through editing basics. The common concerns of photographers have been addressed by Adobe today with the launch of Photoshop Elements 2019 and Premiere Elements 2019. Packed with new editing functions, guided tutorials and a refreshed layout, the updates to the affordable photo editor are perfectly pitched at its user-base of beginner and hobbyist photographers. The announcement comes in advance of Adobe MAX 2018. This annual conference is the highlight of the creative calendar, with over 12,000 graphic, web and multi-disciplinary designers expected to descend on the Los Angeles Convention Centre from 15-17 October. We'll be reporting from the even itself to bring you the most inspirational insights, so make sure to check back in for updates at the time. 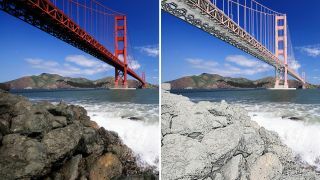 Powered by Adobe Sensei, which earlier this year gave Photoshop CC users the ability to detect objects in a click, the Photoshop Elements and Premiere Elements updates focus on streamlining the apps' usability and making enhancements easier to discover and use. The first change users will notice is the Elements Home Screen, which has been specially designed to surface information on what's new since the last version. It also highlights content tailored towards each user's level of expertise, making it easier for people to expand their skill set. Photo collages and video slideshows can be created automatically from the Home Screen with the help of Adobe Sensei. These updates to Adobe Photoshop Elements 2019 – surely designed with the Instagram generation in mind – allow photographers to customise their collages in just a few clicks. HEIF support has also been added. Other features enable users to turn photos into text art, sketches, and even memes. And with the use of 53 step-by-step photo editing guides, common edits, such as boosting a certain colour or changing the background, are now accessible to all. Meanwhile, over on Premiere Elements 2019, the redesigned Quick Edit mode provides a user-friendly and, as its name suggests, quick, way to find and trim a user's best footage. New overlay effects top off the release, including a glass effect and a bold Luma fade transition, and there's also VFR, HEIF and HEVC support. While some of the advice and edits in this launch might appear basic to advanced Photoshop users, it's always good to see a release that makes it easy for beginners to get started. And with a more intuitive display guiding you through the tools, this comparatively affordable release is sure to be a welcome upgrade for existing users, and a tempting offer to those new to the world of Photoshop.